The Stone Atelier products extend from fully engineered fireplaces (conventional as well as rumford), our speciality, to rock facings, stone floors, paving stone and traditional cobblestone. Working in close cooperation with owner and architect also allows to create truly unique and special products like this stone light post, that both incorporates illumination and serves as a point of attachment for a glass railing. Another aspect of our products is the unique personalized stone carvings or inlays, manufactured to order in our workshop. Whether you have an idea or a set design, or want to entrust us to propose you a custom design, we will create a genuine unique piece that will definitively add character to your home ! 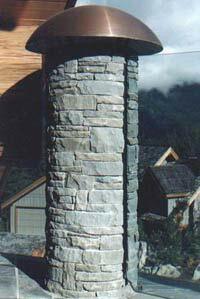 Those carvings and inlays can then either be installed by us, or just be purchased and installed by your own stone mason.